Sonic the Hedgehog was a long-running series of comic books, produced by Archie Comics and starring Sonic and his friends. It frequently featured Knuckles the Echidna back-up stories (but in recent years is a part of the Sonic stories). 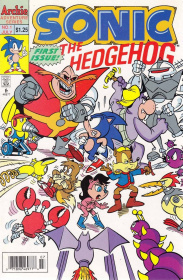 In this comic, Sonic would be handed the same storyline as SatAM to work with, a storyline that was a joint effort by Sonic Team and SoA, before any other creative teams expanded on the ideas. In the comics he lives in Knothole, a city-like place in more recent stories (in the past it taking a more "small village" look). The status quo is definitely changing from a band of Freedom Fighters who fought an evil dictator-like figure (Doctor Robotnik Prime) to fighting a Robotnik from another zone who intends to conquer just like the old Robotnik did. Unlike the early comics when there was a shattered kingdom, the newer ones show that the shattered kingdom has now recovered and perceived recognition once again. Eggman, who is actually another Robotnik from another zone, (the other from the zone the story takes place in a.k.a Robotnik Prime, is presumed dead), has found its location and now they are in the middle of a war with the kingdom, which the King and Queen Acorn now rule over in Knothole. The Archie Sonic comic also made a number of adaptations. For instance, while it stuck to the same foundation as SatAM It has also adapted some of the video game's storyline, which has also introduced characters like Knuckles the Echidna and Shadow the Hedgehog. However, while Archie adapted quite a number of plot points (usually by the mandate of Sega themselves) it also has made a few of its own storylines not adapted by the games. It has adapted original plots and has also created its own original characters for the comic (ex: Mina Mongoose, Elias Acorn). Following an undisclosed hiatus in early 2017, Sega announced the cancellation of the Archie Sonic the Hedgehog comics on July 19, 2017, ending a long 24-year run. It was succeeded by a brand new comic published by IDW Publishing in April 2018. This page was last edited on 29 October 2018, at 16:34.